Units in the Drysolair 11 series were developed especially for discharging high levels of internal moisture to the atmosphere. Through the pre-cooling in the recuperator of the air to be dried, the unit works with considerably lower compressor performance than a simple heat pump system and creates a consistently good climate in ice rinks, the drying of buildings or industrial drying processes. The combination of first-class components with precise control and regulation guarantees economical operation at all times and adjusts the temperature and humidity to requirements. In recirculation mode humid air is dehumidified in two stages and supplied into the room as dry supply air. 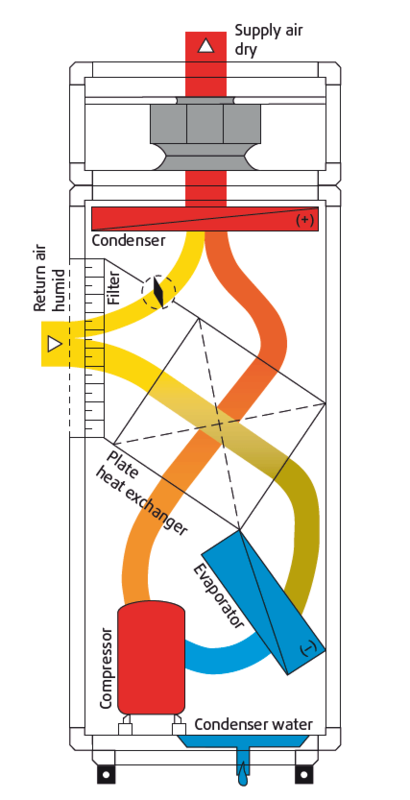 The return air is pre-cooled and dehumidified in the plate heat exchanger. The dehumidification to the desired supply air humidity level takes place by means of cooling the air to below its dew point in the evaporator of the heat pump. The air that has been dried in this manner is then warmed back up again in the condenser of the heat pump using its own heat, which was removed during cooling, and is brought to the required condition. 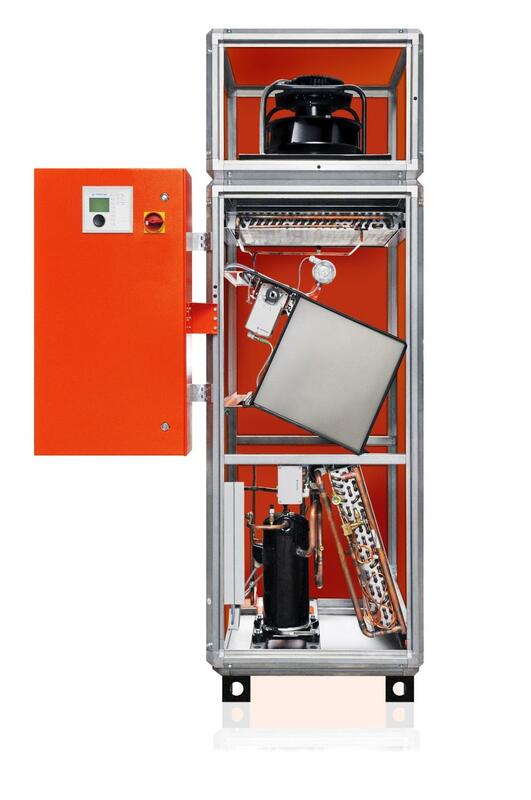 The pre-cooling in the plate heat exchanger of the air to be dried means that the air dehumidification unit operates with a considerably lower compressor performance and hence a significantly lower energy consumption than a simple heat pump solution. The integrated bypass allows fast and precise control and adjustment to the condition of the return air. The cooling capacity is thus continuously adapted to the respective requirements. 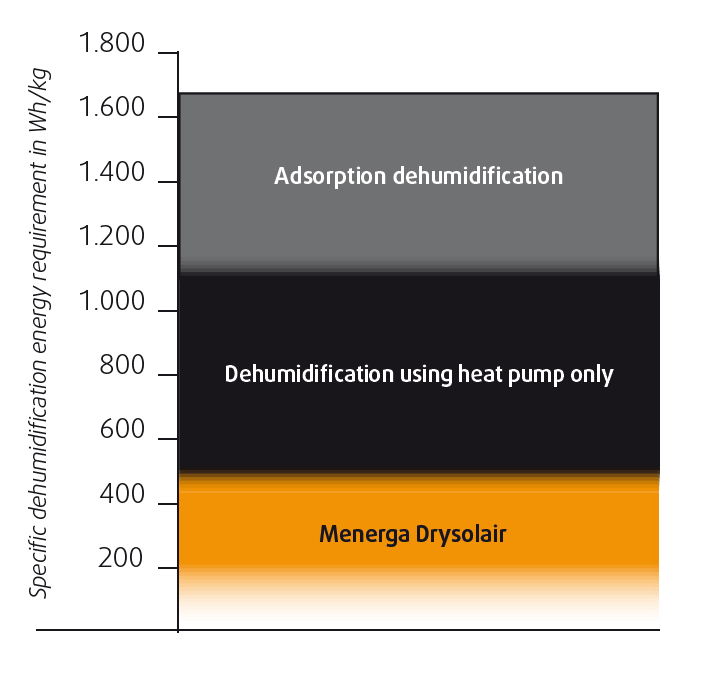 Drysolair achieves a specific dehumidification energy requirement of far less than 500 Wh/kg. With one kilowatt hour of electrical energy, it is therefore possible to remove more than 2 kg of humidity from the recirculation air. In contrast, classical solutions without integrated heat recovery systems reach peak values in excess of 1,000 Wh/kg.